Most Reverend Harry J Flynn, D.D. Leadership Past Bishops Most Reverend Harry J Flynn, D.D. Harry Joseph Flynn was born in Schenectady, New York, in 1933. He was ordained a priest for the Diocese of Albany in 1960, was consecrated the coadjutor bishop for the Diocese of Lafayette in Louisiana in 1986, and served as bishop of that diocese from 1989 until1994. 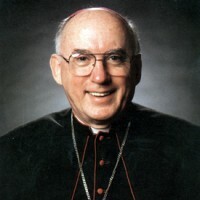 He was appointed coadjutor Archbishop of the Archdiocese of Saint Paul and Minneapolis in 1994, and upon the retirement of Archbishop Roach, became the diocese’s seventh Archbishop on September 8, 1995. Archbishop Flynn was well known for his pastoral kindness to individual persons. With an encyclopedic memory for individuals’ names and needs, he reached out constantly to people of all ages, religions, and stations in life. He directed that personal enthusiasm and warmth to the recruitment of candidates for the priesthood, and for most of his tenure, the Archdiocese ordained more priests than it lost each year through death and retirement. Even before coming to Saint Paul and Minneapolis, he had already distinguished himself by his direct, kind, and honest response to those harmed by clergy sexual abuse, as well as to the perpetrators of that abuse. He joined his predecessor, Archbishop John Roach, as a member of the first Ad Hoc Committee on Sexual Abuse by Priests, a committee chaired by former Archdiocesan auxiliary, Bishop John Kinney of Saint Cloud. Archbishop Flynn later became chairman of the committee, and guided it through the challenging days of 2002-03 as the bishops faced a nationwide scandal. Among his chief organizational accomplishments, Archbishop Flynn saw the completion of a $100 million capital campaign (Growing in Faith); the creation of the Catholic Finance Corporation; promulgation of a sweeping reform of Church employment practices (Justice in Employment); and ongoing improvements to Archdiocesan financial transparency and clergy assignment practices. Archbishop Flynn was deeply devoted to the spiritual formation of clergy, of religious, and of lay people. He often served as a retreat master for dioceses and religious communities, and frequently assisted parish priests in hearing confessions. Like his predecessor, Archbishop Flynn relied upon auxiliary bishops to assist him in his leadership, and consecrated Frederick Campbell and Richard Pates as auxiliary bishops for the Archdiocese in 1999 and 2000. In 2007, Pope Benedict XVI appointed Bishop John Nienstedt of the Diocese of New Ulm as the coadjutor Archbishop of the diocese. Archbishop Flynn retired as Archbishop of the Archdiocese on his birthday, May 2, 2008. Although he is no longer the ordinary of the Archdiocese, he continues to serve the Archdiocese by celebrating some of the numerous confirmation Masses held at the Cathedral of Saint Paul and the Basilica of St. Mary. He also continues to celebrate Mass, give retreats and talks, and attend other events when requested. During the summer months he resides at his home in New York returning to his home in Minnesota in the fall.